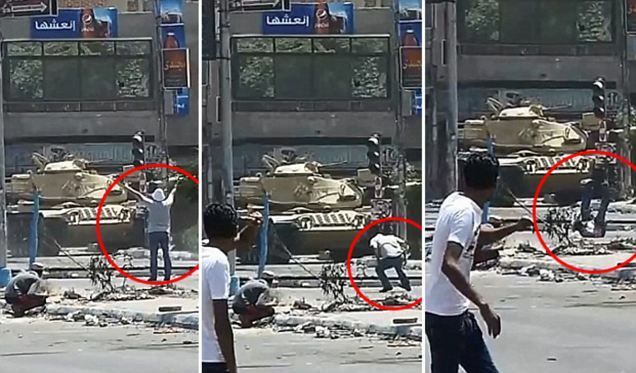 The most crucial part of the clip shows what appears to be the shooting of an unarmed man who stood directly in front of a tank with his hands in the air before being gunned down. NBC News foreign correspondent Ayman Mohyeldin tweeted that the news agency Storyful had confirmed the video's authenticity. 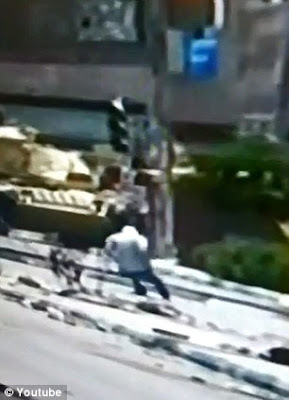 As deadly clashes between government forces and supporters of the Muslim Brotherhood continued in Egypt Friday, a disturbing video has emerged that appeared to show the military firing on unarmed demonstrators. It has not been established if the four deaths confirmed in Ismailia are related to the events depicted in the video. 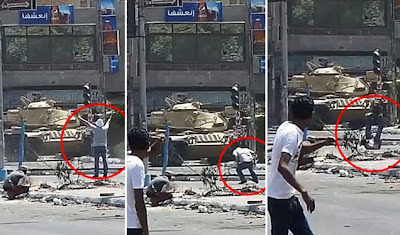 NBC News foreign correspondent Ayman Mohyeldin tweeted that the news agency Storyful had confirmed the video's authenticity. 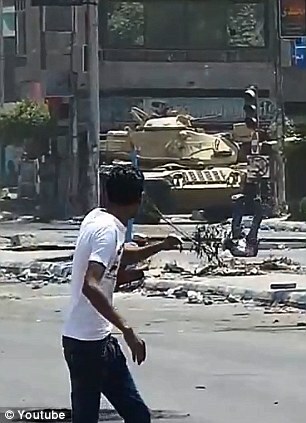 The unsettling clip begins with a group of men numbering more than two dozen marching on four tanks positioned on a city street. The demonstrators appear unarmed, many of them raising or waving their hands in the air. Two of participants are carrying an unfurled banner. About 30 seconds into the video, rapid gunfire erupts, prompting some of the protesters to drop down to a crouch and others to flee. As more shots are fired, most of the people abandon the street. One person, however, remains standing directly in front of a tank with his arms raised above his hand. The demonstrator (seen in background) appears to be struck repeatedly struck by bullets. Just seconds later, the defiant protester wearing blue jeans, a T-shirt and a white hat appears to be struck by a bullet in his leg. He then falls down after apparently being shot again. 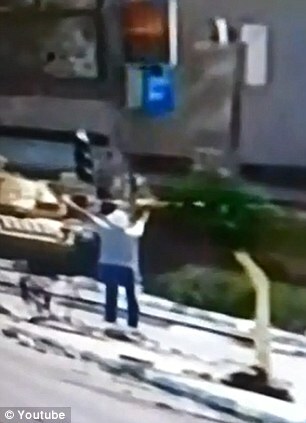 A young man in the foreground who witnessed the shooting grimaces and gesticulates in anguish before running away, while the alleged shooting victim is seen rolling over on the ground next to another man. A cell phone video of the alleged shooting, recorded from a different angle by another eyewitness, was also posted to YouTube. That clip shows the protester getting shot directly in front of a tank. 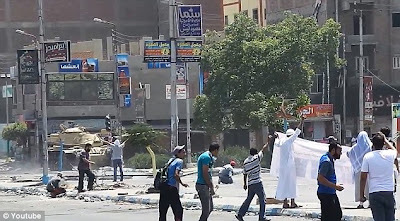 News reports said more than 40 people died in clashes that spread to Alexandria, Ismailia, Damietta, Fayoum and other cities. 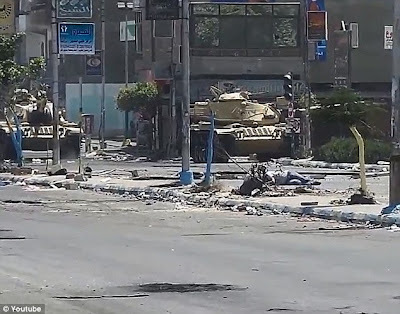 Egypt's military-backed government said there were 27 confirmed deaths nationwide. 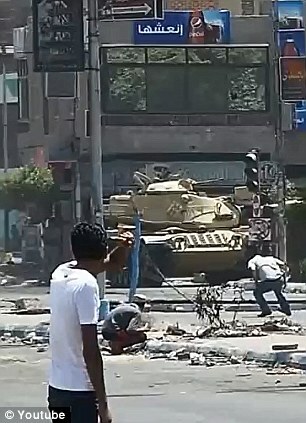 Last night, at least 91 protesters and police were feared dead in Cairo as a ‘Day of Rage’ ended in inevitable bloodshed. 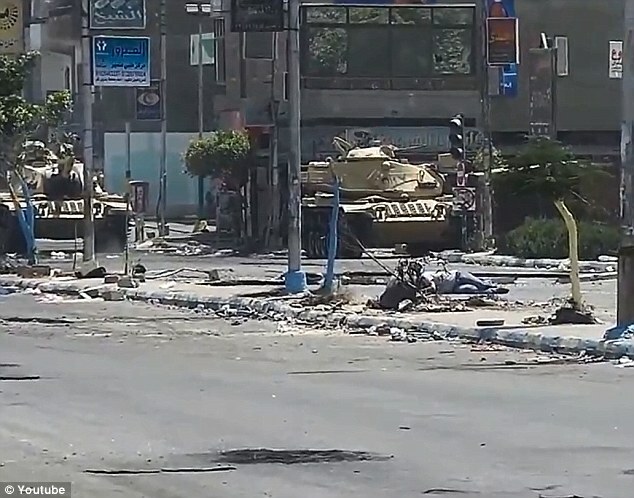 Supporters of ousted president Mohamed Morsi called for fresh demonstrations after more than 600 people were killed when attempts to clear protest camps earlier in the week turned into a massacre. 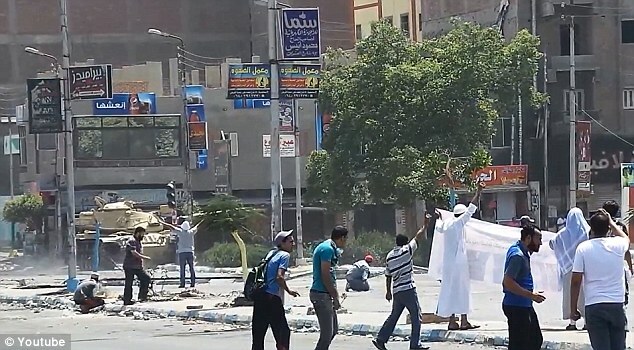 The fresh violence erupted when tens of thousands of protesters took to the streets after Friday prayers.